Congratulations to the JAG CT Class of 2015! After a successful launch this January, JAG students are graduating this week, proudly wearing the red, white and blue honor chord signifying their successful participation in JAG. 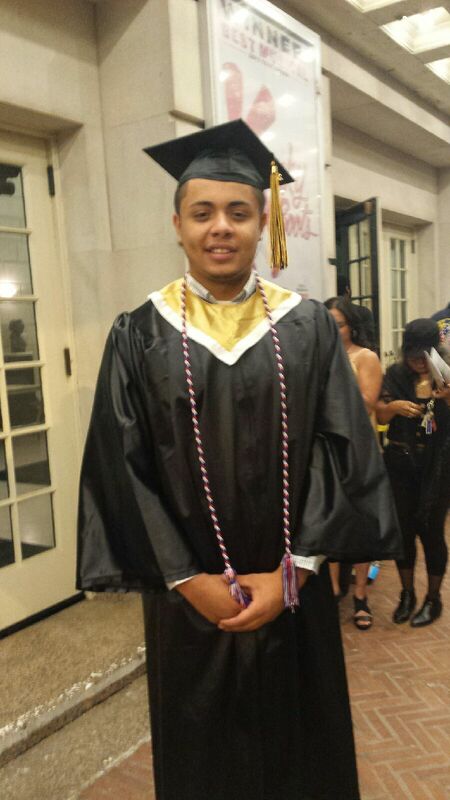 Pictured below is DeJesus Aguilar, who graduated Monday with his East Hartford High School classmates at the Bushnell Theatre in Hartford. Pictured above are New Horizons graduates, from left, Fabiola Gonzalez and Terrance Draughn, their JAG Specialist Courtney Sak, and Dionandre Martin. 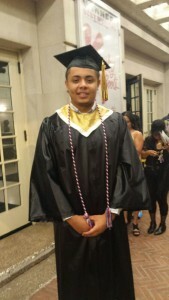 Manchester High School’s commencement was Tuesday at the Xfinity Center in Hartford; Wednesday night was New Horizon’s ceremony, Hillhouse in New Haven is be Thursday, and New Britain High School and the NBHS Satellite Career Academy will be Tuesday. JAG’s six Specialists throughout the state have worked hard on postsecondary planning, job placement, and teaching all of JAG’s professional and life skills. They will now begin the 12-month follow up phase, and have plans to stay in touch with their students throughout the summer and next year. As the JAG specialist at East Hartford High School, I am always looking for ways to bring the JAG competencies to life, and give students the chance to practice their communication, teamwork and leadership skills. One way to teach my students what bosses want in an employee, I thought, was to make my students BE the bosses. So recently I created an activity in which students came up with their own businesses: Creating a logo, a dress code, and description of what they want in their workers. Who’s the Boss? Alex Strevel (fitness club) and Yanneliz Perez (doughnut shop) tell their classmates what they are looking for in an employee. The students then presented their business ideas to the class and had their classmates fill out applications for the businesses where they wanted to work. As the boss, they looked over the applications and interviewed prospective employees. The interviews were given in front of the class so they could see how others did and provide and get feedback. I was very impressed by my students’ ingenuity in creating their businesses, and enjoyed seeing them help each other by giving positive feedback during the interview portion of the project. Students said they enjoyed the exercise too. “It helped me get more comfortable answering interview questions. I appreciated the critiquing so I can work on what I did wrong,” Alex Strevel said. 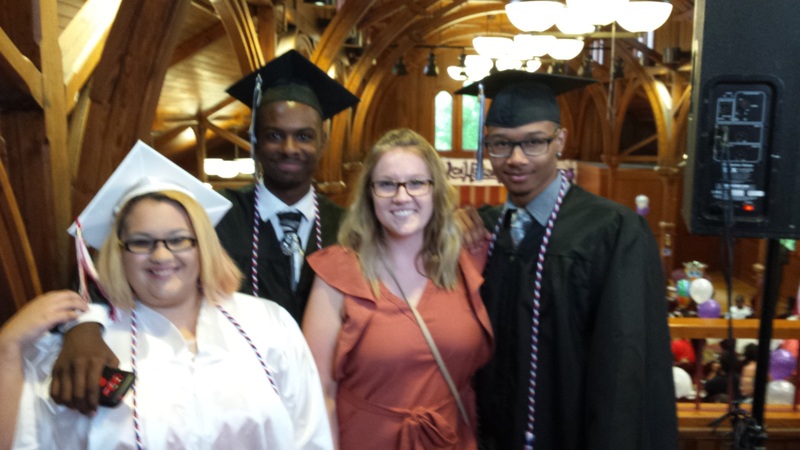 Mayor Marcia Leclerc delivered JAGCT seniors a special send-off this month at East Hartford High School, stressing the importance of positive relationships and the wide range of possibilities that await them after graduation. She also gave them a primer on being mayor. “Make sure that everything you do is a representation of your greater self,” she said. During Leclerc’s time with the students in the job skill and career-readiness program, she talked about the attributes for success, asked them about plans after high school (most are continuing their education and one is enlisting in the Navy), signed yearbooks and talked about being mayor. Several students asked Leclerc about her job, including what is her favorite part. She said being mayor “is an awesome job,” but it does require a huge commitment of time, energy and desire to serve the community. Leclerc said the favorite part of her job is meeting the people she represents. She told the students her talk with them is one such happy occasion. She told them to be open to the possibilities of what can be.